Bangi, 18 November 2014 – The PERMATA Pintar Programme can help overcome the country’s pressing need for human capital in areas related to Science, Technology, Engineering and Mathematics (STEM). 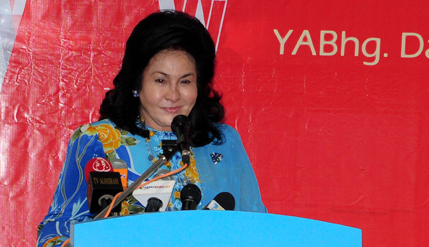 The Prime Minister’s wife, Datin Seri Rosmah Mansor said the younger generation who are able to use scientific knowledge to shape a new era can be produced through the programme. Opening the Third Nobel Laureate Mindset Workshop at The National University of Malaysia’s (UKM) PERMATA Pintar centre here today, Datin Seri Rosmah said students with a Nobel mindset will be able to ensure success in an increasingly competitive world. The PERMATA Pintar Centre is Malaysia’s only centre of excellence responsible for identifying gifted and precocious children from around the country and providing them the opportunity to develop their true potential. The five day workshop beginning yesterday involved 200 students and 20 young researchers from all over the country. “The positive impact of the Nobelist mindset programme is being felt today. I was told that the young researchers who can be the backbone of the scientific community, have invited secondary school students to take part in their projects,” said Datin Seri Rosmah, who is also the patron of the PERMATA programme. She said more than 96% of the students chose to study basic sciences and mathematics at PERMATA Pintar. She hoped such a programme will be extended so as to give similar experiences to students across the country. Students who participated in the workshop had confirmed that the programme can help strengthen and motivate their interest in STEM education, she added. Also present at the opening ceremony were UKM Vice-Chancellor, Prof Datuk Dr Noor Azlan Ghazali, Senior Consultant of the PERMATA programme Tan Sri Dr Sharifah Hapsah Syed Hasan Shahabuddin, Director General of Higher Education Dato’ Dr Asma Ismail, Deputy Vice Chancellor (Research and Innovation Affairs) Prof Dato’ Dr Mazlin Mokhtar and Director of the National PERMATA Centre, Dato’ Dr Noriah Mohd Ishak. The Nobel Laureate Mindset Workshop which started last year have received some 400 secondary school students and 40 young scientists to interact as scientists at the centre with some 40 teachers.